Christine Widdall Lecture – Thursday 14th June – Not to be missed!!! We are concluding our programme of visiting speakers with what promises to be a sensational presentation, “In My View”, by Christine Widdall. 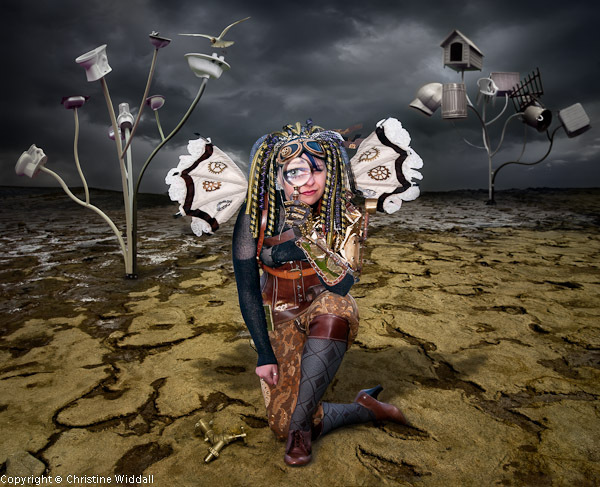 Check out her website http://www.christinewiddall.homecall.co.uk/ If this work does’t inspire your creativity, nothing will! Featured Image: The Collector I came upon Jess in the graveyard at Whitby Gothic Festival, just as it was getting dark. I had to use fill flash to expose her wonderful outfit correctly and I waited until I could get just the right angle to see her magnified eye through the glass magnifier. The composition that I have created is inspired by Salvador Dali's clocks hanging from trees. The ground was taken in the dry salt plains of southern Provence. The tap, which I felt was essential to finish off the picture, is on the wall of our garage and seemed to be the hardest bit to capture because we had seemingly weeks of dull dark and rainy weather!